Coca-Cola presents the "Here I Am Talent Search with Monica" Competition! R&B Artists, this is your chance to stand up and proclaim, Here I Am! In honor of GRAMMY award-winning artist Monica's latest album Still Standing and new single "Here I Am", OurStage and Coca-Cola are teaming up to bring you the "Here I Am Talent Search With Monica" Competition presented by Coca-Cola! 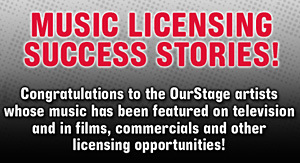 OurStage R&B artists can enter their best original track by May 22, 2010. One lucky artist will be selected out of the Top 10 for a chance to get behind the mic, live on stage with Monica at Birthday Bash 15 in Atlanta, Georgia, and a shot at $7,500 cash! Artists must be eighteen (18) years of age or older at the time of entry. Individual artists or a band member must be a legal resident of the 48 contiguous United States. One song submission per artist will be accepted into the competition. Accepted genres must fall into the following R&B genre-based category on OurStage: R&B and Soul. All entries must be acceptable for radio airplay with clean lyrics. Entries must contain vocals, but do not have to consist solely of vocals. Entries must be accompanied by musical instruments.